Recorded in raw, bare bones conditions, mostly live and with traditional Cambodian instruments finding their place alongside found keyboards or guitars, the music of the Khmer rock musicians transformed the nightlife of the Cambodian capital, Phnom Penh—and many years later seduced countless listeners around the world with their groovy sound. The rise to power of the anti-Western, fanatical Khmer Rouge in 1975 caused drastic and permanent changes for Cambodia. These years saw social upheaval in the form of massive famines, selective executions and a brutal campaign of genocide responsible for the deaths of an estimated two million Cambodians, many in the notorious “killing fields.” Even the most famous and beloved Khmer musicians could not escape. SINN SISAMOUTH (“the Emperor of Khmer Music”), ROS SEREYSOTHEA(“The Golden Voice of the Royal Capital”), and PAN RON met their deaths at the hands of the Khmer Rouge. The music of these honored musicians and others live on in this exclusive 2xLP edition, assembled with much love and respect for the artists who made the Khmer rock scene as thrilling as we find it to be. The music is wild and anarchic, rhythmic and undulating, sometimes sweet and lyrical, but always moving. Cambodia Rock Spectacular! captures that deep soulfulness ingrained in the best music; and along with its sister album, Cambodia Rock Intensified!. 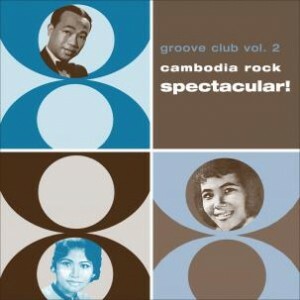 It is perhaps the most definitive collection of classic Cambodian rock music to appear on the scene to date.